Front view of the WSU-TFREC Overley Lab. The Tree Fruit Research and Extension Center (TFREC) hosts twelve WSU faculty and five USDA­‐ARS scientists who conduct research and outreach on annual and perennial specialty crops. Although the primary emphasis is on apple, pear, and cherry. Disciplines represented include entomology, horticulture, plant physiology, plant pathology, and soil biology. There are also administrative staff and farm and facilities personnel, eleven visiting scientists and post-docs, twenty technical support staff, twenty-three graduate students and several summer interns associated with research and extension programs. Google map view of TFREC. 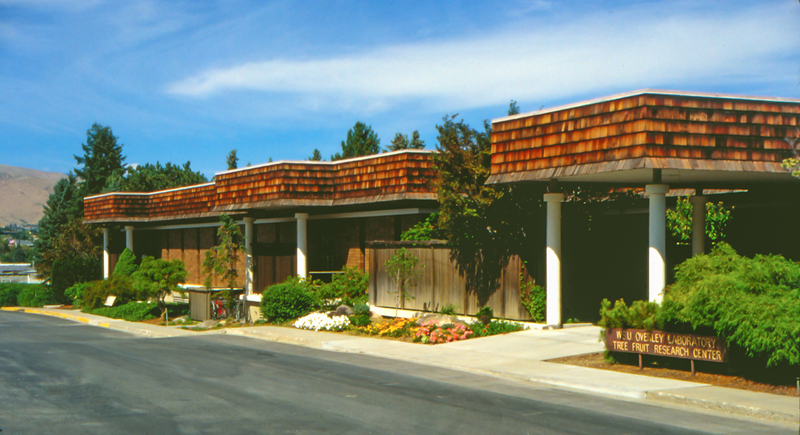 The main TFREC campus is located within the city limits of Wenatchee, WA, is approximately 30 acres in size and is comprised of two primary office buildings (one housing WSU personnel; the other housing USDA-ARS researchers), entomology and insect ecology laboratories, greenhouses, pesticide and regular storage buildings, a cold storage/packing line facility, multiple student housing units, and the physical plant facilities. The number of on-campus planted acres has decreased over time. However, there are still experimental blocks of apples and pears at the Center. 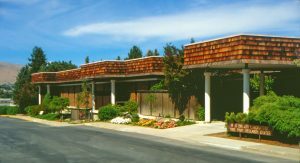 The bulk of the research plantings are located off-campus at the Columbia View Orchard (CV) and the Sunrise Research Orchard (SRO). Columbia View Research Orchard (CV) This property is located about 10 miles north of Wenatchee off Hwy 2/97, is 92 acres in size with roughly 43 that are sutable fr orchards. 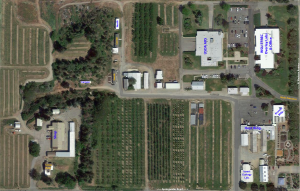 This site was given to WSU by the tree fruit industry with the stipulation that USDA-ARS would have access to half of the orchard for their research activities. This location has equipment storage, a caretaker’s house, and storage for pesticides and fuel. Sunrise Research Orchard (SRO) This property was purchased in 2006 by WSU as a site for a new research orchard replacing the Center’s recently sold on-campus orchard blocks. SRO is located about 15 miles south of Wenatchee just east of HWY 28. The total site consists of 300 acres with 150 acres suitable for orchards (partially due to water rights limitations).